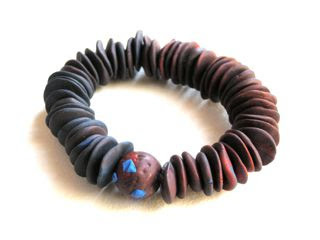 Continuing with my obsession of making polymer clay beads, I experimented with mixing of colors. I took two colors, Premo copper and Fimo pacific blue, and mixed them in varying intensities. The first incarnation of this bracelet used 14 gauge copper wire but it was giving me fits, so I switched to simple elastic cording and I like it much better.